It's a small-world coincidence that the heads of two Vermont college dance programs got their starts in the same place: Christal Brown of Middlebury College and Paul Besaw of the University of Vermont both began their contemporary dance careers at the University of North Carolina in Greensboro. Though they studied at different times, they shared a teacher: acclaimed modern dancer and choreographer Jan Van Dyke. This week, the three will unite on three stages in the Green Mountain State for "NC Dances VT." The evening-length performance features works choreographed by Besaw, Brown and Van Dyke. 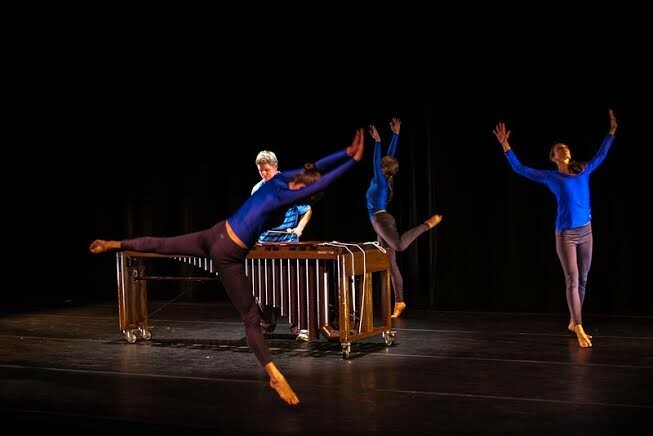 The show comes to Middlebury College tonight, September 18; to the University of Vermont on Friday, September 19; and to the Contemporary Dance and Fitness Studio in Montpelier on Saturday, September 20. The UVM performance is sponsored by the Lane Series, marking the first time the Lane and the Department of Music and Dance have collaborated on a show. It's also the first time in more than 20 years that the Lane has presented dance. Director Natalie Neuert says more such partnerships are to come. "NC Dances VT" marks a first for Besaw and Brown, too. "It's really exciting to be sharing a program with someone who laid the foundation for my career as a dancer," says Brown of Van Dyke. "And sharing a program with Paul is really exciting, because I think it's what we want the dance community to be like in Vermont." Brown notes that she and Besaw hope to foster more interactions of their respective dancers and institutions in the future. "It’s going to be really interesting for me to have my work right next to Jan's," Besaw says with a laugh. "Because, to me, it seems almost too obvious, the way in which Jan's influenced the way I make dances." Van Dyke's work is known for its rhythmic precision and tight structures. Since retiring from UNC Greensboro, she's continued to direct her eponymous dance company and produce the North Carolina Dance Festival. Brown and Besaw bring new solo work as well as past pieces to "NC Dances VT." Van Dyke is bringing two older pieces, including one that Besaw performed two decades ago. "It’s very rewarding to have alums now that organize things, and it kind of makes a full circle," Van Dyke told Seven Days earlier this week. When it comes to choreography, though, she won't comment on her former students' accomplishments: "I haven’t seen their work yet!" she exclaimed. "It’s a mystery."